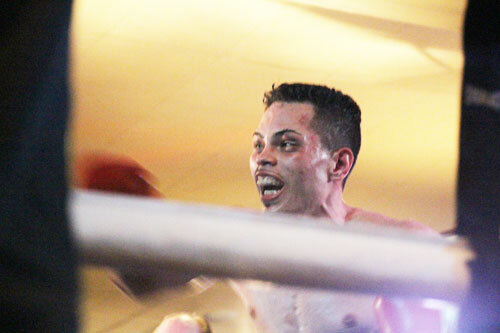 Anthony Caputo Smith pulled an upset Friday night with his gritty 10-round split decision victory over favored Tony Ferrante at Harrah's Chester. Most believed that the fight would be a war for as long as it lasted, implying that Smith would not be around to hear the final bell. However, the Kennett Square brawler not only lasted the entire distance, he dictated much of the action with his dogged style. The fight was a true war and delivered on pre-fight hopes that this match between these two very popular fan favorites would make for a memorable fight. There was no surprise in this. Both boxers fought hard and thrilled the crowd, but the way the bout unfolded was as unexpected as it was entertaining. Each round of the fight played out in similar fashion. From the start, it was clear that when he had punching room, Ferrante was the superior fighter. He was able to land a good jab and a strong right cross. If the fight proceeded in this way, it probably would have been a one-sided affair. 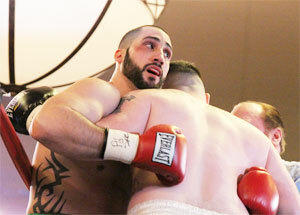 However, there were two men in this fight, and Anthony Caputo Smith had an answer for the hard-punching Ferrante. 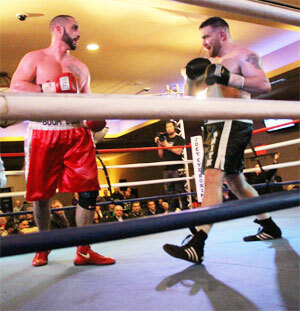 At the sound of the bell to start each round, Smith would race across the ring to lock horns with Ferrante. Smith's motive was clear, to close the gap between them before the heavy-handed Ferrante could get off his dangerous blows. Often Smith was successful, bulling Ferrante to the ropes before firing his own windmill bombs that landed rather gently on Ferrante's face. Ferrante would try to wiggle free from Smith's pressure and two-arm grip, but in doing so, he allowed much time to pass while his back bowed the strands of rope. This was the impression left through most of the fight. Smith's attack was not devastating. It did not carry artillery heavy enough to put Ferrante's lights out. Not in the least. But it was effective. Like his previous victory over Dhafir Smith, Caputo Smith used the broad strokes of momentum to paint his victory against Ferrante. 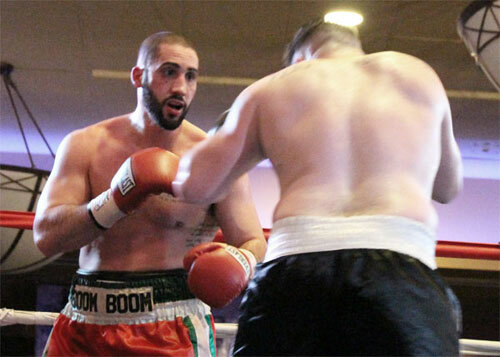 You might make the argument that both Dhafir and Ferrante landed the cleaner shots on Caputo, but the overall impression left from the action was that the underdog was fighting his fight and doing what he wanted to do. It wasn't pretty or particularly dangerous, but it worked extremely well. Smith's attack was aggressive, but not vicious. He was more like an annoying gnat that just won't leave you alone. The method worked, but only because he had a willing participant in Ferrante. At first, Ferrante swatted at the harmless gnat, but then seemed to decide that since he wasn't being hurt, Smith's incoming punches didn't count. It was a miscalculation. What Ferrante failed to realize was that although Smith's punches weren't hurting him physically, they were killing him on the scorecards. Smith was chipping away at victory, all night long. He survived everything Ferrante threw, landed his own punches. And the whole time he had Ferrante pressed against the ropes. Along the ropes, the battle was filled with terrific two-way punching. Both fighters landed and each came away with marks on their faces that clearly indicated the business they are in. It was an excellent and entertaining scrap with both fighters working hard and delivering a thrilling battle. Smith fought the only way he could, while Ferrante continued to make the same mistake round after round - allowing Smith to carry out his plan without making him pay. Once however, Ferrante did flip the script and it almost ended the fight in a single instant. In round six, Ferrante suddenly found punching room and drilled Smith with a left to the body and a ferocious right to the head. The punch thumped against Smith's temple and stopped him in his tracks. His arms flailed loosely from the impact of the blow, and after a beat, Smith crumbled to the canvas. As referee Steve Smoger began to count, it did not first appear that Smith would get up. Ferrante stepped out of the neutral corner to prematurely celebrate his victory. Smoger interrupted his count to send him back to the corner, and the incident added some time to the 10-count. As Smoger reached the count of nine, Smith pitched upward and avoided being counted out. A second later, the bell to end the round sounded, and perhaps saved Smith from his demise. Instead of Smith folding and the fight ending in the 7th, the battle resumed just as it had at the beginning of every other round. Smith stormed across the ring and pressed Ferrante to the ropes. This is exactly why Smith won the fight. He chugged his way to the final bell, and did everything he could to win the fight. Ferrante was more effective in the final act of the fight, but other than the knockdown, Ferrante rarely did what he does best. Instead he fought Smith's fight. Still after 10 rounds, the fight was very close. All three judges scored the fight 95-94, with just one point separating the fighters. Judge Dewey LaRosa favored Caputo Smith. Judge Lynn Carter scored the fight for Ferrante. Finally, judge David Braswell settled the matter with his 95-94 tally in favor of Caputo Smith. My scorecard also had Smith in the lead, 95-94. It was a very good fight that could have gone either way on the cards. Many of the rounds were quite close, and at ringside the opinion of the press was also split. The important thing to remember about this one was how honest and hard-fought it was. If all fights could be like this one, the local boxing scene would be booming. 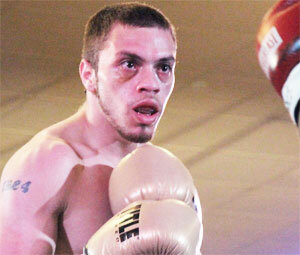 Caputo Smith improved to 15-2, with 10 KOs. "It was a tough fight," Smith said afterward. "All I was hearing for six weeks was how hard he punched. But I wasn't going to change my game plan. I was coming at him from bell to bell. He is a hard puncher, I'll give him that. But I'm not stopping. I coming after him, no matter who he is. That's how I fight. Nobody was giving me a chance (before the fight), but I'm a warrior. I don't care who you are, I'm coming after you. I'm not out-boxing nobody. I have to come after you." A disappointed Ferrante went home 12-5, 7 KOs, 1 ND. "I'm in shock," Ferrante said in his dressing room. "I landed way more effective punches, especially the right hand. I put him down. All he did was smother me. I tried to get away. It got to a point where I was even holding my hands down at my sides just to prove a point that I couldn't get out (from his clinching). I just thought I landed so many more punches." The good news is that even before the ring was broken down and all the chairs stored away, promoter Joey Eye, Anthony Caputo Smith and Tony Ferrante had all agreed to staging a rematch. The only question was whether the second fight would occur in March or May. Same place, same match. Let's hope we'll get more of the same. It was a terrific fight. There were two 8-round co-feature bouts on the card. 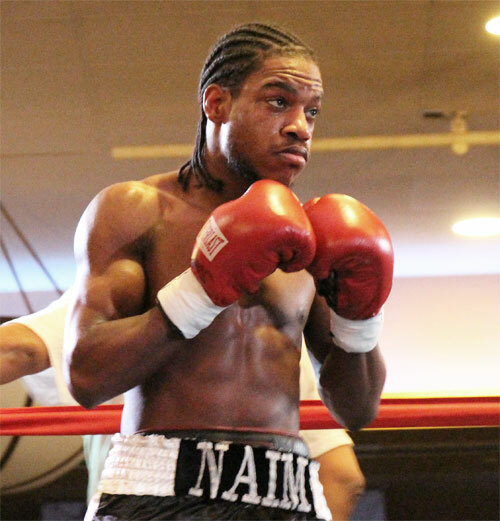 Lightweight Naim Nelson returned after a ten month injury layoff to win a narrow split decision over Christian Steele in an 8-rounder. The time off clearly did not affect Nelson's conditioning. He appeared to be in excellent shape, but did exhibit some ring rust that nearly cost him the bout. Nelson also had to deal with a very motivated Christian Steele, a fighter much better than his modest record indicates. Steele capitalized on Nelson's rust by jumping out to an early lead. I gave him the first three rounds, but each of these periods - especially the first and second - were extremely close. Nelson loosened up in the fourth and fifth, and took them both with sharp power punches. But like many of the other rounds, the fifth was a squeaker. Steele responded well and edged the next two rounds, which gave him a slight lead on my card after seven. By the time the fighters clashed in the eighth, Nelson had shaken off his rust and had his best round of the fight. Two of the official judges saw the fight comfortably for Nelson. Pierre Benoist had it 79-73, and David Braswell scored 78-74. Given the handful of close rounds, these scores are understandable. Dewey LaRosa saw the same fight that I had, and turned in a 77-75 tally for Steele. Nelson remained undefeated at 11-0, 1 KO, while Steele dropped to 4-8-2, 2 KOs. It was a good, tough matchup between solid lightweight prospects, and a rematch might be nice to see. 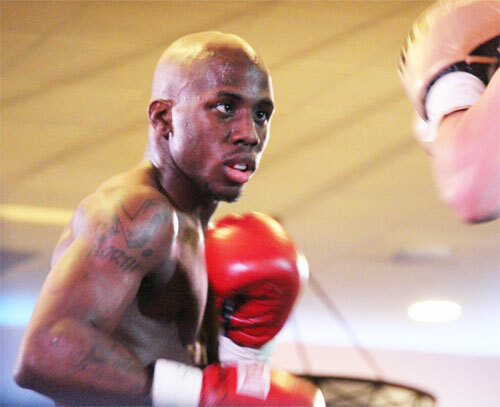 In the other co-feature attraction, North Philly featherweight Tevin Farmer used his usual dose of speed and energy to breeze his way through eight rounds of action with fellow-southpaw Noel Echevarria of Winston-Salem, NC. I scored all eight rounds for Farmer. However the official judges saw the bout a bit closer. Lynn Carter and Dewey LaRosa each gave Farmer six rounds for a 78-74 score. 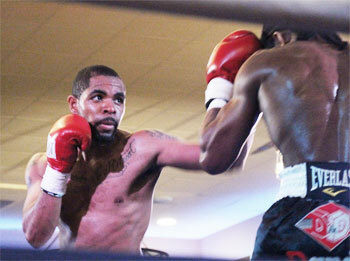 David Braswell had it 79-73 for Farmer, or 7-1 in rounds. This was the 8th straight victory for Farmer, 15-4-1, 3 KOs, who last year won seven bouts and transformed himself into a rising local star. If he can have another busy and successful year in 2014, he will likely break the 126-pound ratings before 2015. 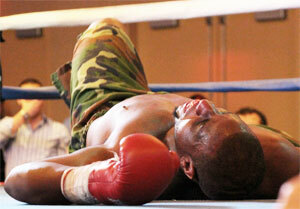 Echevarria lost for the second straight time and slipped to 11-2, 6 KOs. 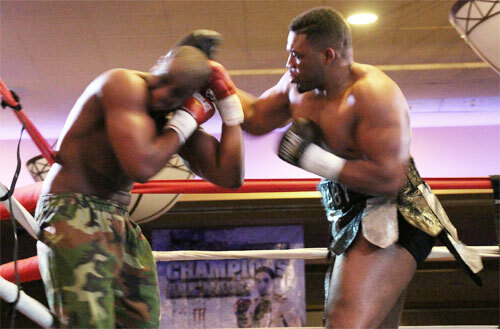 The four preliminary bouts were topped by a scheduled 6-rounder between heavyweights Jarrell Miller, Brooklyn, and West Virginian Jon Hill. After a slow first round, Miller started finding his mark in the second. 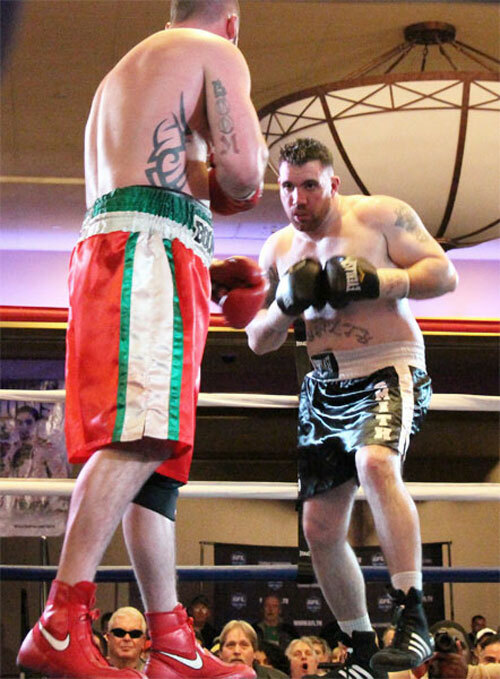 Fully warmed up, the Brooklyn boxer started using his size advantage to wear down his left-handed opponent. Miller hurt Hill in the third with a right hand that also bloodied Hill's nose. It was the punch that set the clock for the end of the bout. Little by little, Hill lost ground in round three. As Miller pressed and punched, Hill retreated to the ropes and finally succumbed to another right hand. The stiff punch dropped Hill, but he managed to struggle to his feet. However, once upright, Hill leaned back hard against the ropes and squinted in pain. In unspoken boxing talk, this usually means, "I've had enough". Referee Shawn Clark got the message, and halted the bout at 2:38 of the third. Miller, 8-0-1, 8 KOs, continued his winning ways, while Hill, 6-5, 5 KOs, lost for the third straight time. In an entertaining 4-round welterweight bout, Jovan Sosa, Bronx, won a unanimous decision over Anthony Prescott, Cherry Hill, NJ. 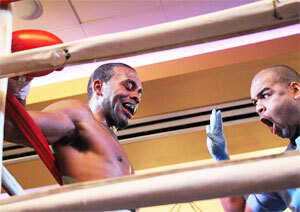 After Prescott trapped Sosa in a corner and took the first round, Sosa got it into gear, beginning in the second. Sosa staggered Prescott with a hard left hook in round two and later cut him over the left eye. 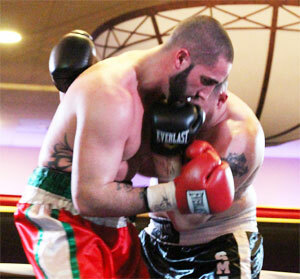 The third was a terrific session, and Sosa secured it with a powerful right uppercut and a strong left hook. He also won the fourth round. All three judges, Benoist, Carter and LaRosa, scored the fight 39-37. I had the same score. 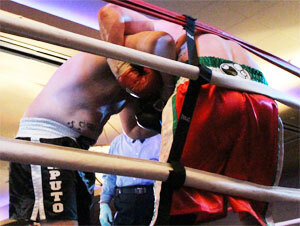 Sosa improved to 2-0; Prescott fell to 2-3-1, 1 KO. Brooklyn middleweight Ievgen Khytrov won his second pro fight (2-0, 2 KOs) with a third round TKO of Romon Barber (4-7, 3 KO) of Wichita, KS. 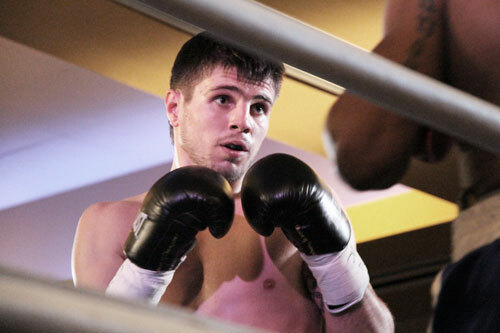 Khytrov dropped Barber for a nine count, with a right in round two. Barber got up, but the bell saved him from further punishment. In the third, Khytrov landed another hard right that sent Barber into the ropes and prompted referee Shawn Clark to administer a count. The bout was stopped a moment later. The time was 42 seconds of round three. 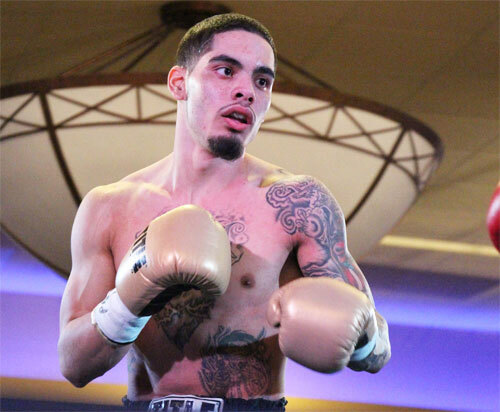 In the show-opener, featherweight Robert Irizarry won his first pro bout (1-0-1) beat southpaw Arthur Parker (1-10-1, 1 KO) by unanimous 4-round decision. 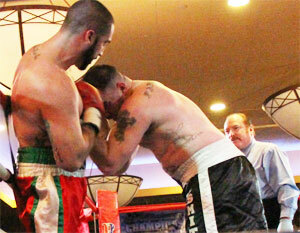 All three judges, Benoist, LaRosa and Braswell, scored the fight 39-37 for Irizarry. My score agreed. A full house of noisy boxing fans came out to Harrah's Chester for the event. 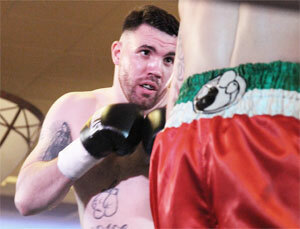 Joey Eye Boxing returns to the venue with another card on March 21st.